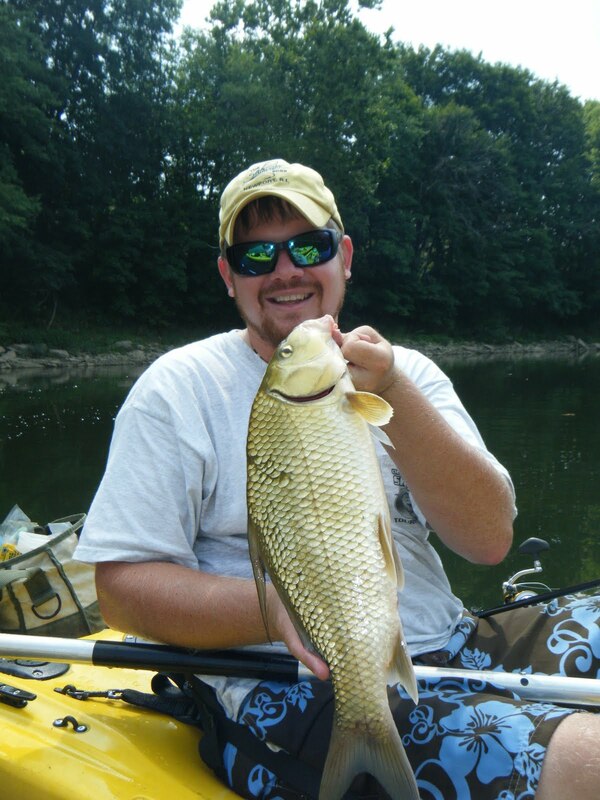 Toby Jones Fishing: Fall is JUST around the corner!!! This summer has been one of the hottest (and driest) summers that I can remember, and thinking back to last year's comfortably-cool and wet summertime weather provides no relief. Still, I believe we have made it through the worst of it at this point. The end of August is now upon us. The days have been growing noticeably shorter, and the nights have been growing longer. Before long we will be seeing signs of fall, and it is my hope that seeing some more fish on my line (SOON) will be included in those signs of fall. As for the past couple of weeks... fishing has been S-L-O-W (at least for me). Last week Marianne had some time off of work, so we decided to break out the kayaks and hit the water. 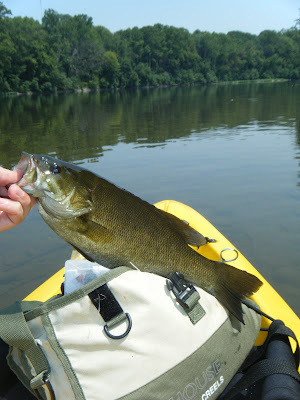 On our first outing we spent a few hours fishing and exploring a local lake, and on our second adventure we made a nice float down the Juniata River. We did a fair amount of fishing mixed in with the paddling on both of our trips, and we did do some catching as well. We each got a few small largemouth at the lake, and we also caught some smallmouth on the river as well. Marianne caught the largest bass, which was a healthy 14 inch smallmouth and I got a nice quillback carp. The river fish were particularly tough during our float. We each saw good numbers of some very nice bass, but most of them were not quite aggressive enough to be caught. 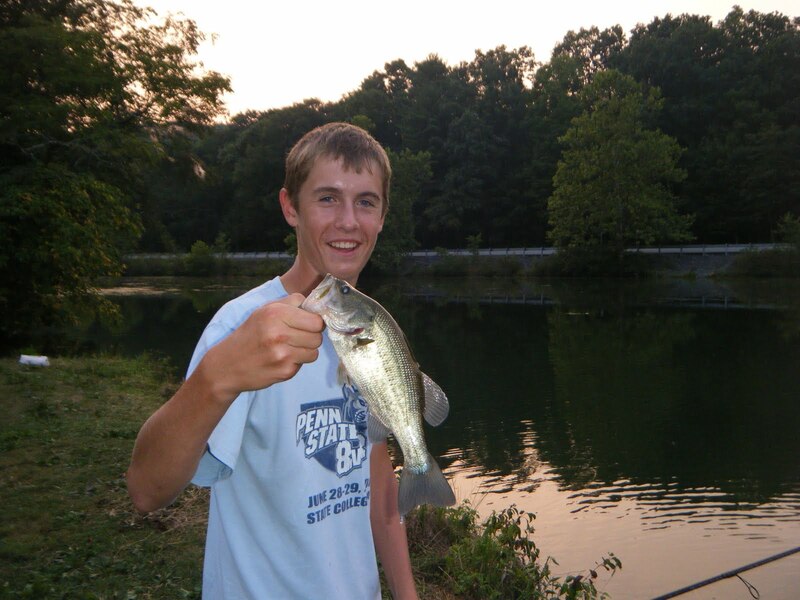 Oftentimes they would chase our lures, but would pull up just short of biting. I tried numerous lures and techniques hoping that I could figure out how to trigger a bite, but in the end I just couldn't quite put the pieces of the puzzle together. 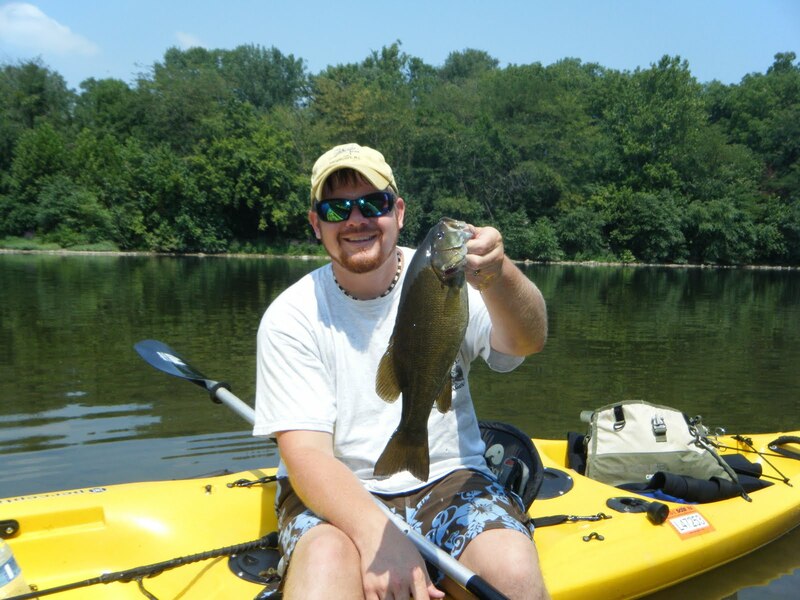 The water was VERY warm during our float, and I think the high temps had much to do with the tough fishing. Marianne and I also had a nice evening picnic at a local lake this past week as well. We met up with my family and ate some good food and did some fishing along the shoreline. My nephews each caught a couple bass (Bailey is pictured at the top of the page) and I got a couple small ones as well. Moving on from freshwater to salt, this past week my buddies Brad and Chad accompanied me on a quick trip to Assateague Island where we met up with my good friends Zack, Jenny, and a large portion of Jenny's family for some shark fishing. Every year I try to make it down to the beach to spend some time chasing sharks with these guys, and we always have a blast! Unfortunately, the weather did not cooperate very well for us this year. Monsoon rains made tent camping very impractical and uncomfortable (especially for three 6 ft. tall guys). So we decided to come home early, after only one evening of unproductive fishing and looking at a very unfavorable weather forecast. In hindsight we should have stayed longer, as the rains stopped and the shark fishing turned on for Zack soon after we left... In the words of my wife, "Ya win some and ya loose some." :) I guess we lost that one.... Still, I'm looking forward to next year. 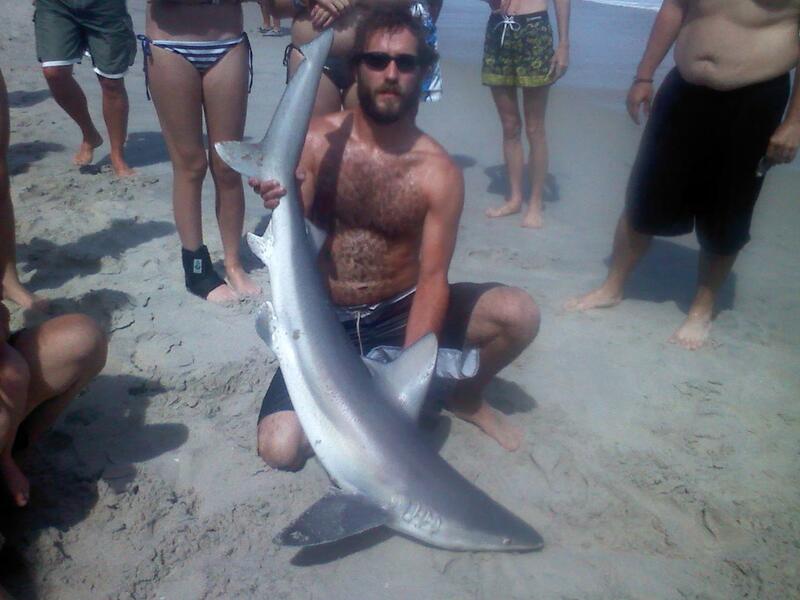 Here is a pic of Zack with a nice sandbar shark that he caught earlier in the week. I guess that is all I have to share with you in this entry. Hopefully things will turn around soon... In fact, I believe they will. In the past I have always seen an increase in smallmouth activity as the summer comes to a close, so look for things to start turning around in the next couple of weeks. With any luck I will get back to you with a more positive report soon! Until then, thanks again for reading and hopefully I'll see you on the water.